The start of December brings both joy and dread to my heart. Joy because I’m all about warm fuzzies and family memories. Dread because the thought of Christmas crazy scares me. Maybe you understand? If you’re like me, you didn’t do a lick of Christmas preparation in October, and you didn’t buy gifts throughout the year either. So now we’re looking at one month to do All the Christmas Things. If I’m not careful, the Christmas crazy can overtake me. And the last thing I need is to fall headlong into a frazzled holiday rush. 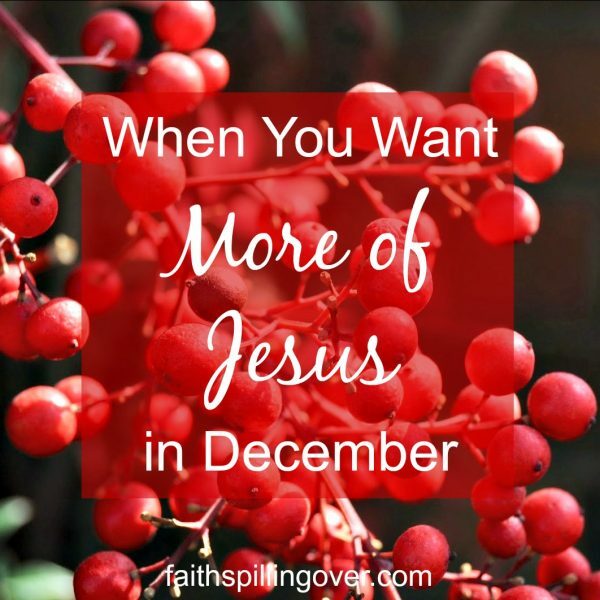 I want more Jesus and less Christmas crazy in December. So I get intentional about choosing just a few fun activities. And I celebrate Advent the whole month long as a time to welcome Christ into my heart and life. For me, it’s a way to put the brakes on Christmas crazy. Advent means “arrival.” Can you remember a time you got excited about the arrival of a special guest? When my son Andres was eight, I invited a dear family friend to dinner one evening. Andres adored our friend and wanted to make sure he was the one to open the door for her, so several hours before her arrival, he pulled up a chair to the door to sit and wait. What if we were that intent on opening the door to more of Jesus in our lives? This December let’s open our doors and welcome Jesus in. Let’s invite Jesus into our everyday. When Jesus comes, He brings glory, fresh strength, and purpose to our work. He opens our eyes to joy. He brings hope to our disappointments and assurance that there is more to life than what we see. Let’s invite Him into our broken places. When Jesus comes, He brings His Spirit to renew our faltering faith. His Word speaks truth to our doubts. He brings His power to our weakness, healing to our brokenness, and redemption to our failure. How do we invite Jesus in? How reassuring to know He’s always there, waiting for us to let Him in. Let’s not miss out on what He has for us. Let’s open our doors to Him. How about slowing down a few moments each day to slip into His presence and rest there? Whether we linger over morning coffee, or set aside ten minutes before bed, our Savior is waiting for us to open the door and invite Him in. Reading our Bibles opens a way for us to meet with our Lord. When we read His Words, we hear His voice. Let’s open our eyes to see His hand at work in our daily lives. Let’s invite Jesus to shine His light into our hearts. What do we need to let go of? Where do we need forgiveness? When we repent, He promises to cleanse and make us new. Let’s make Advent a special time to open our doors to more of Jesus. 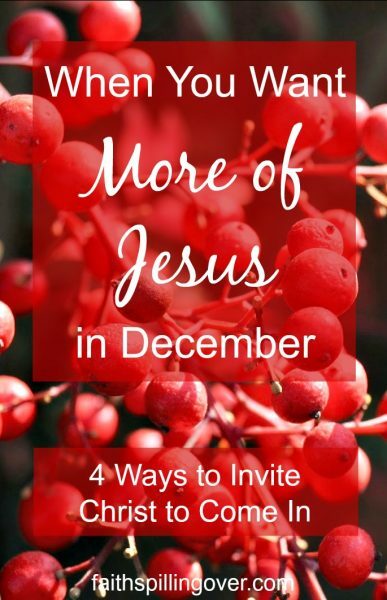 Will you join me in opening the door to more of Jesus this December? Each Tuesday, I’ll post a devotional on one of Jesus’ “I am” statements from the book of John. Next week, join me for a look at how the Light of the World shines into our darkness. Let’s make Advent a special time to open our doors and welcome our Savior in. As He comes, may He set our hearts on fire with His joy and hope. 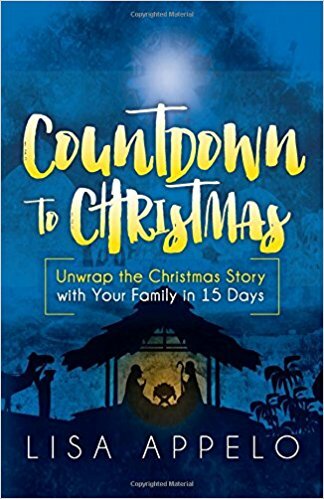 I also want to recommend an excellent Advent devotional for families, Countdown to Christmas: Unwrap the Christmas Story with Your Family in 15 Days, available in hardcover and Kindle. My friend Lisa Appelo, mom of 7, knows what real-life Advent with kids is like. I love that, Adrienne. We have a tradition several years back of giving each family member the chance to choose one activity. For years, we did Advent readings every night, but when my kids got older, it began to feel like “Law” to them. So now we do it 2-4 times a week. May the Lord bless your family this December. Though I have read through the bible a number of times I don’t remember that particular verse in Revelations. I must admit that I tend to read through Revelations rather quickly as it’s quite strange and bizarre in some places and I don’t seem to be able to relate to it. However, every once in a while I stumble upon a verse and see that I should be reading it much more slowly. I will look forward to your Tuesday devotions. I have to be in the Word this time of year or I will come unglued. Another favorite Advent tradition of mine is reading Ann Voskamp’s “The Greatest Gift” devotion and putting the ornaments on my Jesse Tree each day of Advent. It gets my heart in a preparation for His arrival state of mind. I’ve never read it! Although I did have a free download once, which was the precursor to it. And I have a beautiful set of printable paper ornaments from her. I wrote the scripture references on the back of each one and still use them on a Jesse Tree. Yes! All the opens! And this is such a good time of year to focus on Jesus Himself. Thanks for your honest sharing about the mayhem and how you cope with it all. Blessings to you, and I’m looking forward to this series. Glad we’re walking shoulder to shoulder, Michele. I appreciate you so much. Great post, Betsy. I love the story of your son waiting for a guest to arrive. The good news is that Jesus is already waiting for us! I need to pull up a seat and visit with him this December, every day, through prayer and studying God’s Word. Thank you for this reminder! Sharing on FB, Twitter, and Pinterest. Thanks for sharing, Sarah. My husband smiled as he remembered our son waiting like that for our friend. May the Lord bless your times with Him this month. This message of this post touched my heart. Just what I needed to hear, and just what I want. More of Jesus and less of Christmas crazy! I enjoy your blog and sweet spirit. Thanks so much, Dana, for the encouragement. Praying more of Jesus for you now. This is SO necessary in my life these days, Betsy. Thanks for bringing it to my attention. Looking forward to your Tuesday posts! Thanks, Jarm. It’s necessary in my life too. Blessings to you, friend. Amen! I learned long ago to make Christmas the joyful season I longed for and remembered as a kid, I had to do my Christmas crazy before Thanksgiving. Now, I’m that annoying person who has every decoration up, tree lit, gifts wrapped the day after Thanksgiving. And this year that I’m retired, the cookie baking I save for later in December can be done leisurely instead of in a frenzy the Saturday before Christmas vacation. I love celebrating Advent every day of December, too, even continuing after Christmas day. Praying God blesses you with peace and joy as you seek Him first. Wow, Debbie, you even have your gifts wrapped?? That’s amazing. I’m glad that you’re able to enjoy December in a leisurely fashion now that you’re retired. JOY! I love that picture of Andres sitting in the chair in front of the door! What a beautiful image of how we should anticipate the arrival of Christmas:) Thank you for offering a new perspective for the season, Betsy. May we all have a less rushed, more peace-filled December! We were chuckling to ourselves remember it, Kristine. Amen to less rush and more peace with the Prince of Peace. I so appreciate these ideas for opening up to Jesus this coming month, Betsy. Unfortunately, my family has made Christmas too much about Santa and gifts over the years. I’m really hoping to create some Christ focused traditions this year. Thanks for the inspiration! Thank you for reminding us all what the Christmas season is really about. I loved the story of your son waiting for a guest to arrive. It shines the light on my heart to keep my focus on Jesus and not on the Christmas crazy. May the Lord bless you this season, Connie, as you seek to keep your focus on our Savior this season. You are speaking my language, Betsy! Slow down, prepare, invitation and intentionality. I will be joining you because there is nothing like the arrival of Jesus. He is the gift! I also love the idea of invitation during this season. Making room in my heart for Jesus and opening the door for Him to enter instead of all the hustle and bustle. Love this encouragement! A December sitting in anticipation for His arrival sounds so much better than a December chasing what we think it should be. Well said, Becky! I love that! Keeping the door open for Jesus as He knocks at the door of our hearts . I want to be near when Jesus arrives and not running around elsewhere . Oh , December is here and I am so happy ! The Son of God took the form of man so that He could have an intimate relationship with me . Amen, Diana! I don’t want to be running around elsewhere either. 🙂 But that would be so me, if I’m not careful. 🙂 Blessings to you. Loved the way you organized this post around the word open! Christmas can be uber-crazy. Focusing our hearts on Christ takes intention. Thanks for helping with that! Yes, it can be crazy. I want to open my doors to Jesus. And like Linda said in her comment, that takes saying no to some things. So hard to do! Blessings to your family this season, friend. Beautiful, Betsy. I’m learning that the only way I can receive all of who God is is to say ‘no, thanks’ to many of the distractions and stuff that relentlessly bombard me, most particularly during this season. You are so right about being relentless to say “No,” Linda! I need to learn more about saying that word! Thanks for your encouragement. Beautiful reminder, Betsy, before the crazy take over to open our heart and lives to Jesus. Keeping our focus on why we celebrate. Thanks for stopping by, Laura. Blessings to you and your family this December. Thank you, Dianne. May the Lord surround you and your family with His grace and presence this December! Dear Betsy, so many gentle and practical reminders of how we can keep Christmas holy. But my takeaway is picturing little Andrew sitting by the door full to overflowing with love and anticipation. Thank you for sharing that sweet, sweet picture! Great post Betsy! So love this!! It almost always seem that Christmas kind of sneak up on us. Time gets away and it ends up been a big rush to prepare for the Christmas celebrations. I am all for opening the door of December and letting more of Jesus in…after all, it is his birthday we are celebrating. With the last few weeks before Christmas makes it’s appearance, I am definitely going to be intentional and let more of Jesus in. Betsy, Yes, I want more of Jesus at Christmas. I feel like so many times he gets squeezed out. Well honestly I cling to him because I need him desperately during the season, but it seems to be one-sided not a time of adoration. I want to take some time and honor and praise him. Thank you for your beautiful post. I love the pictures too. Shared to Pinterest.